Happy Things – It Works For Bobbi! Published on April 2, 2009 August 9, 2016 by Bobbi-Jo G.
One of my favorite quotes is “Do one thing that makes you happy every day!” and lately, that’s exactly what I’ve been trying to do! Some of my happy things are things I didn’t think WERE happy things to begin with – like exercising every day this week. I’m not talking dripping with sweat and dying the next day exercising – more like walking/jogging on the treadmill for 20 minutes a day, then on the odd days doing some strength training exercises with dumbbells. Easy! And it feels great. It DOES make me happy, and I’m not going to stop! Creating is one of my hap hap happiest things! And I’ve been doing my share lately. I am in LOVE with the website Houseof3 and their awesome downloadable, printable products. LOVE THEM! This month they were giving away a fun Spring bundle including some blog backgrounds and calendar PNGs (you can still get it, though it costs $3.00 now HERE). 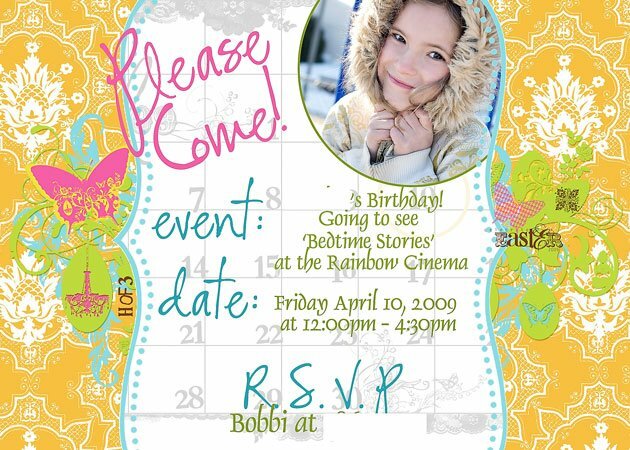 I used one of their backgrounds to create this fun invite for my daughter’s upcoming birthday party! I just created a 5X7 document in Photoshop, then dragged and dropped the background, added my info and a cute pic of my TJ, and we were set to go! 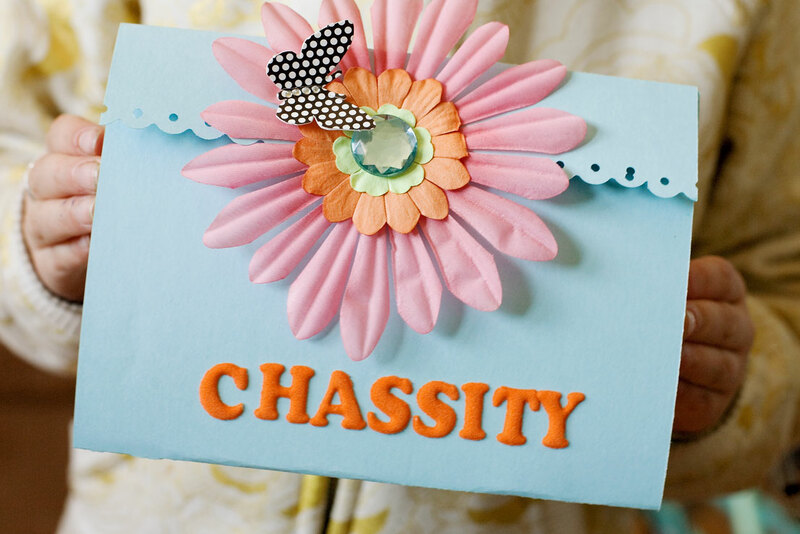 Then I printed it off, punched the two side edges with my scallop punch, and attached it to a cute and easy card that I made using a 7X12 piece of cardstock. I scored it at 5″ and 10″, then punched the top edge with my scallop punch. 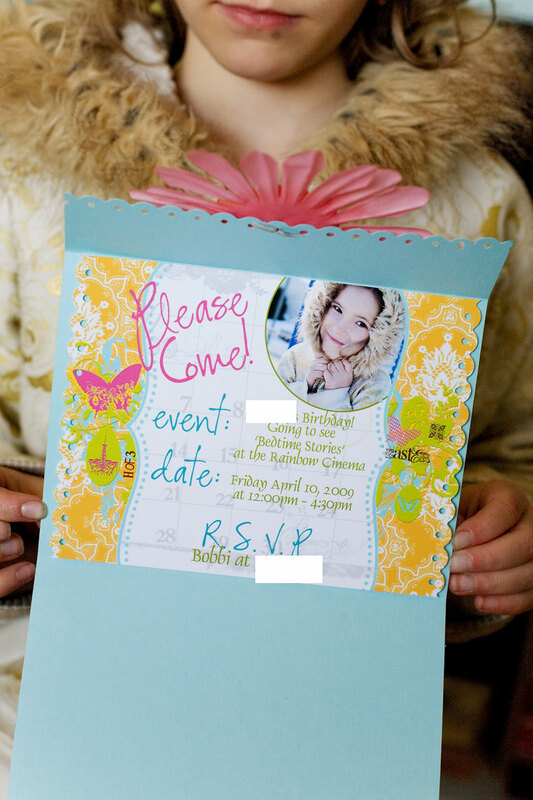 I attached my invite, folded on the scored lines, then attached with fun Prima flowers and a Heidi Swapp gem brad. TJ was thrilled with it, and so was I! It came together in minutes before school this morning! THEN, I was blog browsing, and I came across a super fun collage at Scrapbooks Etc. where you can download a free collage template and play with it – then enter it in their contest, if you’d like. 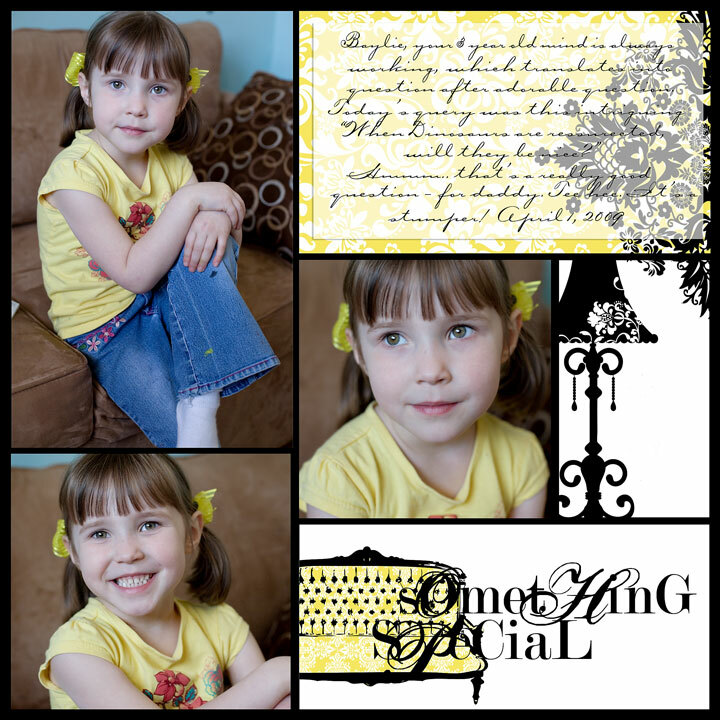 I whipped up this page using papers from Hof3, and pics I snapped of my Bayboo yesterday. I love it! I might print it off as an 8X8 then add it onto a l12X12 layout with more patterned papers. OR, I’ll just print it of as a 12X12 on 2peas or some place like that. Very few things make me as happy as watching my kiddos playing. They sometimes have warped imaginations and in this video, JJ decided my bike was Polly Pocket’s space ship, and SOMEONE BROKE IT! Oh the humanity! I’ve been having such happy thoughts and happy days this past week – even amid the many poo poo accidents JJ has been having, AND the long hours hubby has been spending on his school work and projects. BUT, this too shall pass and I plan to be happy in the meantime! Your posts just make ME happy! : DLove your quick creativity in an instant. You are SO blessed with that talent. I agree with Lynn you and your posts make me happy and those invites- awesome. thanks for the chat today! love you guys. OH! Love lvoe love that invitation. I have to come up with an invite for the achievement day girls to make for a mother daughter tea next month, and this is a great idea!!! I hope you don’t mind if I steal it. Thanks! That’s a pretty cute girl you have there….miss her.